Volcanic Ukrainian Carpathians [Вулканічний хребет українських Карпат; Vulkanichnyi khrebet ukrainskykh Karpat]. (Map: Carpathian Mountains, Division.) The southwesternmost belt of the Carpathian Mountains, located between the Tysa Lowland and the Polonynian Beskyd and Inner Carpathian Valley. 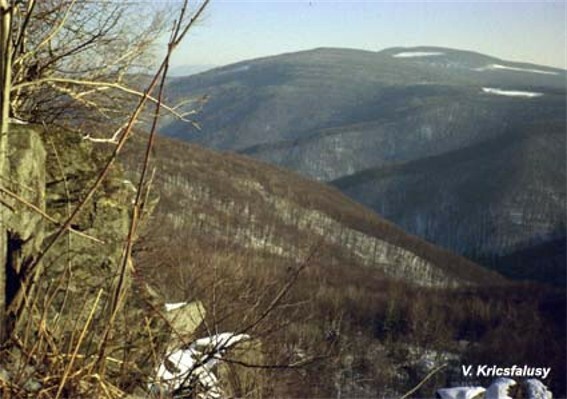 The mountains rise steeply for 600–900 m above the Tysa Lowland to an elevation of 900–1,100 m. They consist mostly of effusion centers joined by lava streams that were created during the sinking of the Inner Carpathians through volcanic eruptions during the Miocene epoch. The volcanic deposits include trachytes, andesites, rhyolites, and tuffs. The Volcanic Carpathians stretch from the Laborets River in the northwest to the northern Romanian border (south of the Maramureş Basin) in the southeast. 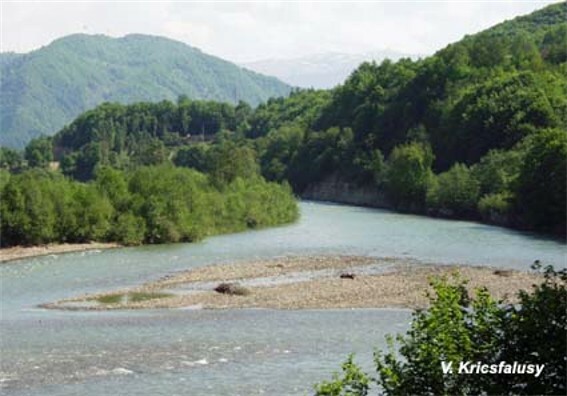 Transverse valleys of the Tysa River and its tributaries divide the mountains into the following groups: the Vyhorlat Mountains (1,074 m), the Makovytsia Massif (978 m), the Syniak Mountains (1,014 m), the Velykyi Dil Mountains (1,086 m), the Tupyi Mountains (878 m), and the Hutyn Mountains (1,093 m). The massive and broad ranges are dotted with picturesque volcanic rings (the remains of craters) and cones. The mountains are almost unsettled and are covered with oak and beech forests. The foothills of the Volcanic Carpathians form a narrow band to the west. They are formed of tuffs and andesites. The land is highly productive—corn, wheat, and grapes are all grown there—and densely populated. The most important cities of Transcarpathia (Mukachevo, Vynohradiv, Uzhhorod) are found in the passes formed by rivers through the foothills. 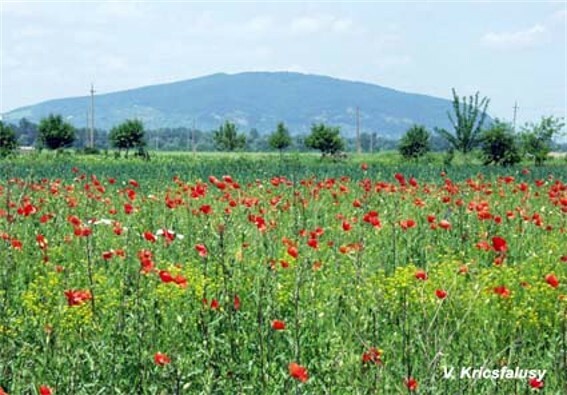 A few isolated volcanic regions are found in the vicinity of Berehove, in the Tysa Lowland.